I think this blog has made it clear we're not a rich expat family dining at 5 star restaurants. Sure we can splash out a bit now and then, but in any case, I am really not into restaurants that serve food based on it's artistic impression - a few slender vegetables balanced on a fish fillet with dribbles and drips of sauce as decoration. No thanks. I want a plate of food. Good, simple, tasty food. And preferably our meal won't cost an arm and a leg. For a family of 4, it would be rare that we spend over 1,000 Baht on a Thai meal for all of us. Plenty of our favourite restaurants will cost us way less than that. A beer or 2 adds to the bill. Lunchtime I normally just have water with a meal. And many times we like to find small street-side restaurants for a meal. 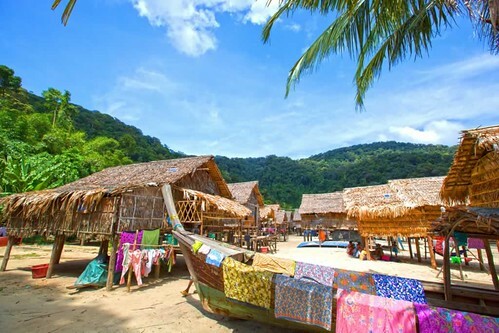 These kind of places are common all over Thailand. Sometimes a meal will cost as little as 40 Baht (rarely less these days). Basic meals with rice and a fried egg on top here in Phuket normally 60 - 80 Baht. And maybe add on 20 Baht for an iced tea or soda. Gomen is one of these cheap streetside restaurants that we often frequent for lunch. 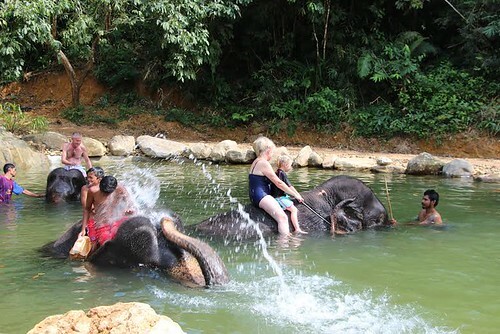 Not far from our house, it's located just off the Kathu Waterfall road near the Phuket Wake Park. It's basically the ground floor of a house, a little family run restaurant for local residents in the area, plus people using the wake park know about it too! There's no sign in English outside - the sign says โกเม่น อาหารตามสั่ง, Gomen Ahan Tam Sang - that second part (Ahan Tam Sang - อาหารตามสั่ง) means "food made to order" and is commonly seen on small local restaurants. You also see small restaurants in Thailand called Khao Gaeng - ข้าวแกง - These have ready made food usually sitting there in pots or trays and you order rice with one or more toppings. If full the place might be able to seat 30 people with tables inside and out. I've not seen more than about 10 at one time, but this kind of place that opens every day 12 hours a day makes good business, once word gets around the neighbourhood that the food is cheap and tasty! You can order pretty much any basic Thai dish with rice, plus they specialise in Khao Kha Moo (ข้าวขาหมู - stewed pork leg with rice, a very common staple) and you can get noodle soup here (Kuaytiaw - ก๋วยเตี๋ยว). (above) Seating at Gomen restaurant. Of course there are plenty of restaurants like this in Phuket, I am not suggesting you need to take a taxi from wherever you stay and find this particular small restaurant. I am saying : if you want a good, inexpensive plate of real Thai food this is the kind of restaurant to look for and this one is now on my blog because it's close to our house and we eat here quite often. (above) Kao Lao - this is like noodle soup, with all the other added ingredients, but no noodles. 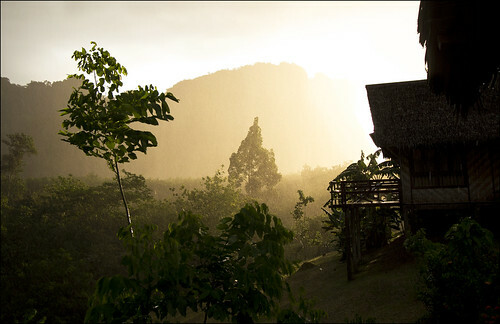 If you happen to be exploring the Kathu area, visiting the waterfall, going wakeboarding ... this place is worth looking for! Other restaurants nearby include Maireab Zaap Ver and The Big Chicken. I wish you happy eating! 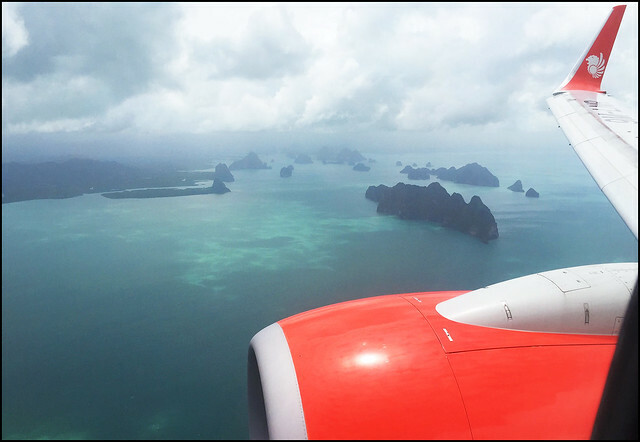 Back in 1999 when I arrived in Phuket, the airport was considerably smaller and quieter than it is now. 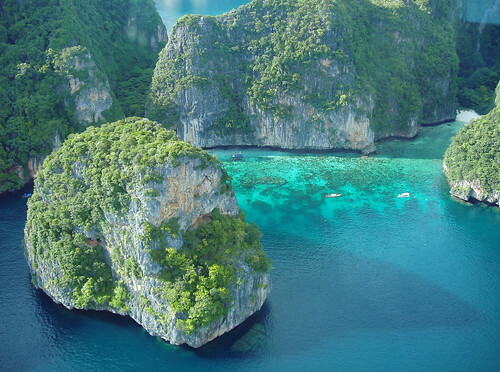 Although Phuket was already a very popular tourist destination, and had been steadily growing since the 1980s, the airport had way less flights and way less arrivals and departures compared to now. 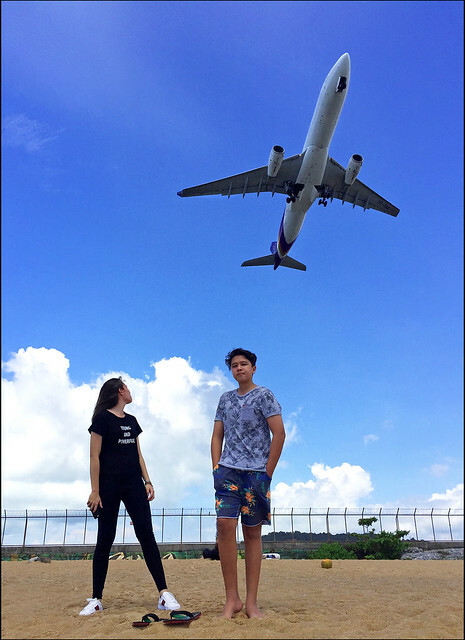 I'm not quite sure where the figures come from, but the Wikipedia page on Phuket Airport has lists of passenger movements and flight movements. Back in 1999, the total passenger volume was about 3 million. This had increased to nearly 5 million by 2004, but dropped back to just over 3 million in 2005 (due to the tsunami on 26th December 2004). But by 2007, passenger volume was up to well over 5 million and it's been increasing ever since. The 2017 figure was over 16 million, with over half from international flights. The airport was overstretched and getting rather outdated with just 1 terminal until the new international terminal opened in September 2016. I flew to the UK that September, out of the old terminal and back into the new one. Wow, a huge difference! Suddenly Phuket airport looked modern! The only issue seemed to be (and this continues to be an occasional issue) the lack on enough staff at immigration. There can be long queues sometimes .. with millions of people entering Thailand through Phuket airport .. there can never be enough staff! But at least the airport is bigger and more modern now. 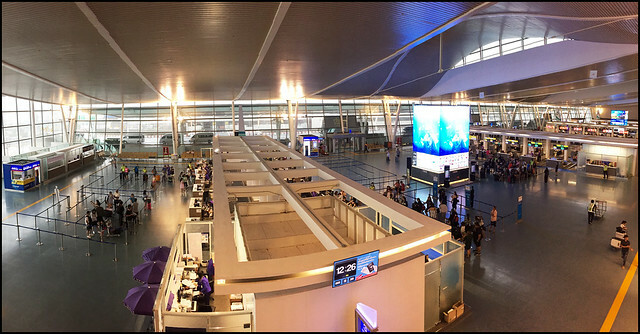 With the opening of the international terminal, the domestic terminal had 18 months of renovations that finished in June 2018. There are plenty of taxi options from the airport to hotels anywhere on the island. My suggestion - pre-book an airport transfer. So nice after a flight to see a taxi drive holding up your name and head straight to the hotel without having to worry about arranging anything on arrival. My friends at Easy Day provide a very good airport transfer service either from the airport or back to the airport. 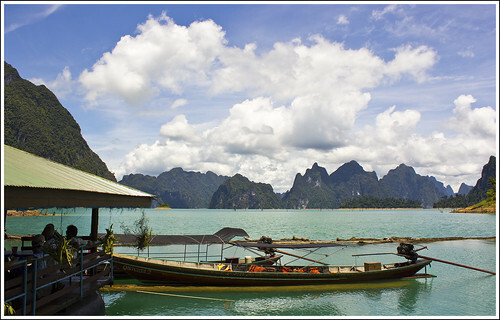 Their rate is around 1000 Baht one way or 1600 Baht for return transfer. That's a fixed rate for any hotel, so a very good deal for hotels further away from the airport! If you book a taxi on arrival from a desk at the arrivals area it might work out a few Baht cheaper to some areas in Phuket. BUT getting back to the airport is trickier. If you get a taxi from outside your hotel for sure the asking rate will be more than you paid to get to the hotel. So that deal offered by Easy Day is a good one! There is a lower budget option - a shared minibus service. Normally about 200 Baht per person and will depart when full .. then take longer to get anywhere as you're dropping people off all over the place and I do hear these cheap options try to make extra money by dropping everyone at tour agencies along the way. 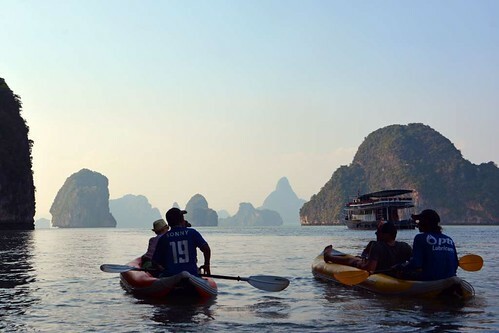 If you are a single, low budget traveler, this may be the way for you. OR how about hiring a car? Many major rental agencies have services at the airport (Budget, Hertz, Avis for example). 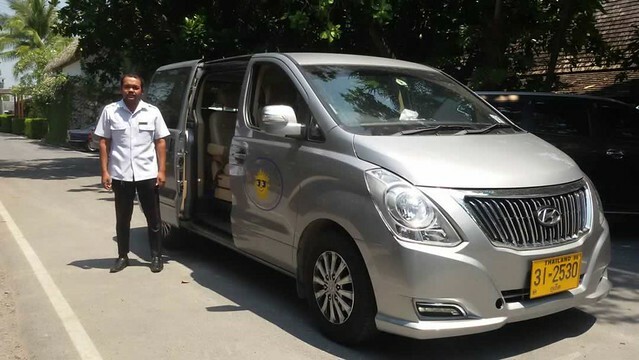 You can rent a car for about 1000 Baht per day. 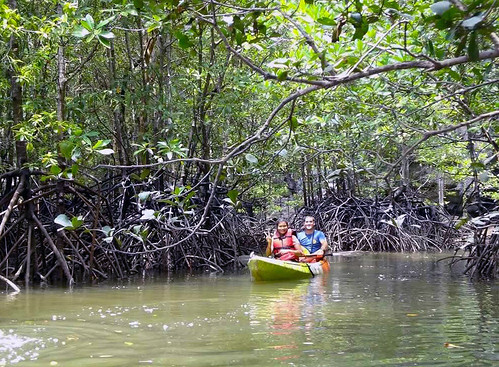 Good if you want to explore larger areas and not just stay by the beach and take a few organised tours. I know the traffic can be a little nuts, but if you are an independent tourist, consider renting a car. Be sure to have an international license. 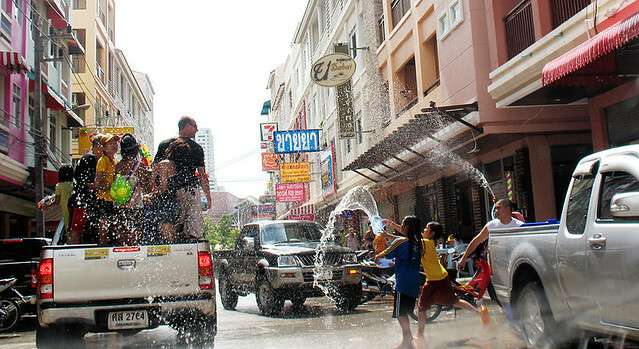 The popular Songkran festival is one of those "love it or hate it" events. It can be viewed as fun, but some people like to complain about it getting a bit silly and losing its traditional roots. Songkran is the Thai New Year festival and is celebrated in Thailand and also in neighbouring Laos, some parts of China and Cambodia. The Thai New Year and Thai calendar were in use until 1888 in Thailand, but now January 1st is used as the official start of the new calendar year. 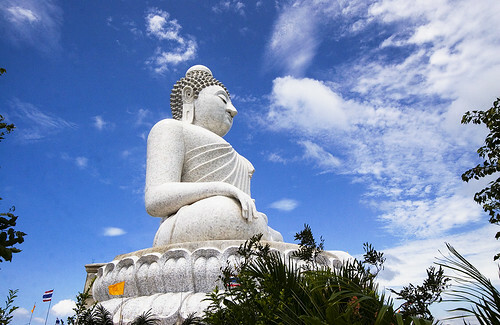 The old Thai / Buddhist year is 543 years ahead of the standard calendar. 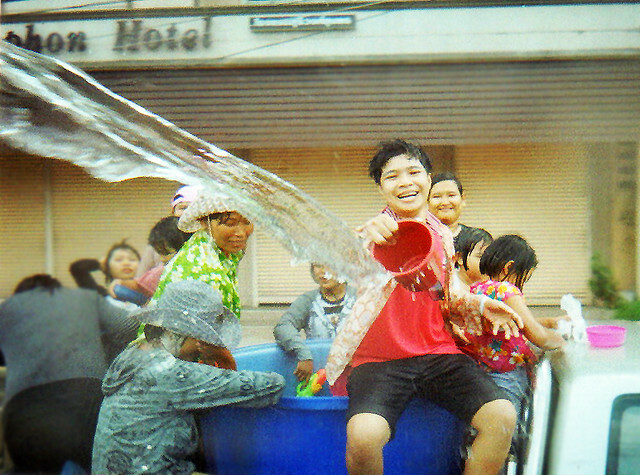 The water throwing is the most obvious aspect of Songkran, but the older traditions are very much still alive. At homes and temples. Buddha images are washed with water containing flower petals, and at some temples, people carry dirt to the temple which is to replace dirt that they have carried away on their feet during the year. Songkran in Phuket is really only 1 day - April 13th - although some people do start to party and throw water in the afternoon of the 12th and the official holiday is 13th to 15th - a public holiday, so there is plenty of partying mixed with the more traditional side of Songkran. 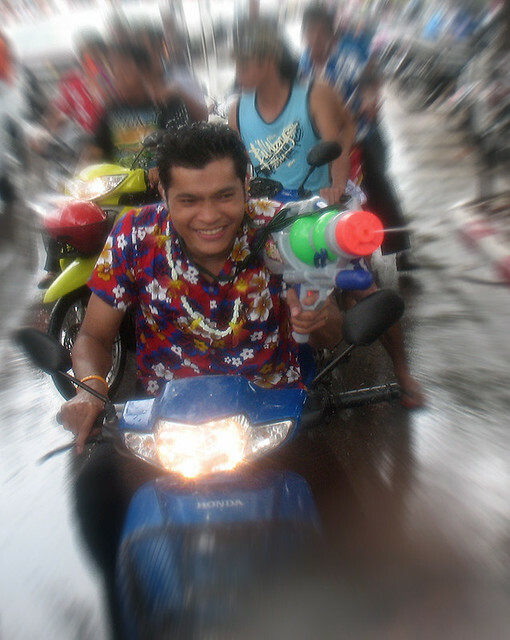 This blog post shows some of my Songkran photos over the years. 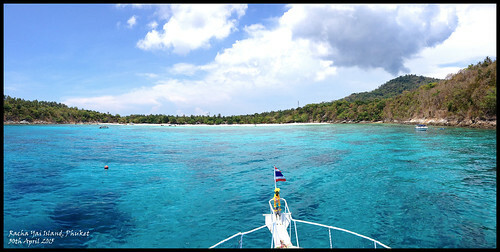 In 2011 I was in Chumphon for Songkran, which is my wife's home town. Maybe the old way of life is a little more obvious here than in Phuket, or maybe I just got a more local feeling since I have been with the family. We had a ceremony at home pouring water on my wife's parents hands (this is called Rodnam Dam Hua). 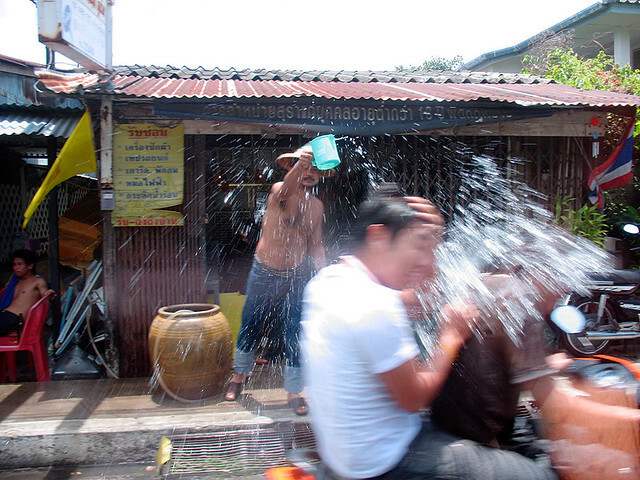 The water fights in Chumphon Town were just as big as Phuket - we drove around town in our pick up. I got singled out quite often - not many foreigners here! Bloody hot day resulting in a very wet and sunburned and slightly drunk Jamie (that's me)! 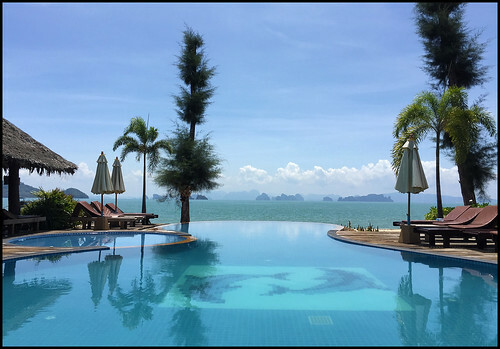 • Phuket Hotel Booking - Phuket is a great place to be for Songkran! So, for Songkran 2011 in Chumphon I took some photos with an old underwater film camera, needed some photoshopping to enhance the colour as the camera used 800 iso film, so most photos were a bit overexposed. Also got some photos on the street near the homes of various family members. (above) Songkran street battle in Patong! If you want to party on Songkran, Patong is the place to be. 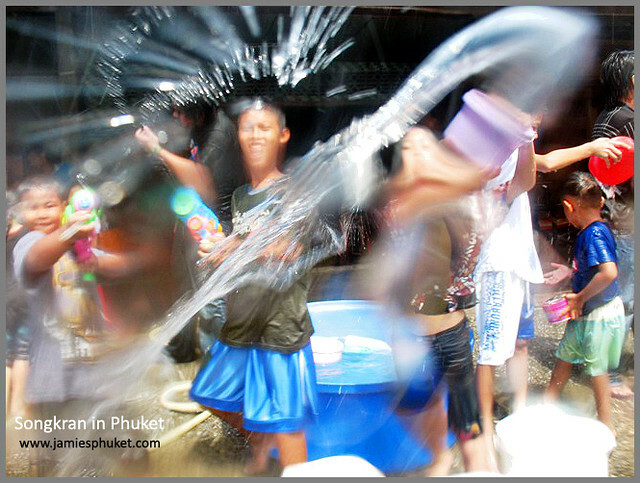 You WILL get very wet, but at least in Phuket the water throwing is limited to just one day (13th April). We enjoyed the day we drove around on April 13th 2009, though the kids did start to get cold - people do tend to throw ice water, which can be a shock, but nice on a hot day! (above) People like to use talcum powder mixed with water and will smear it on your face for good luck. Not everyone wants the powder, but you should accept it in the spirit in which it is offered. Useful hint: Don't wear your best clothes during the Songkran festival! In town, people are scooting around on mopeds, in trucks, or some (like we used to) in cars with the windows up! It's a sad fact - there are a lot of accidents around Songkran mostly related to a combination of fast mopeds, alcohol, water and slippery roads. 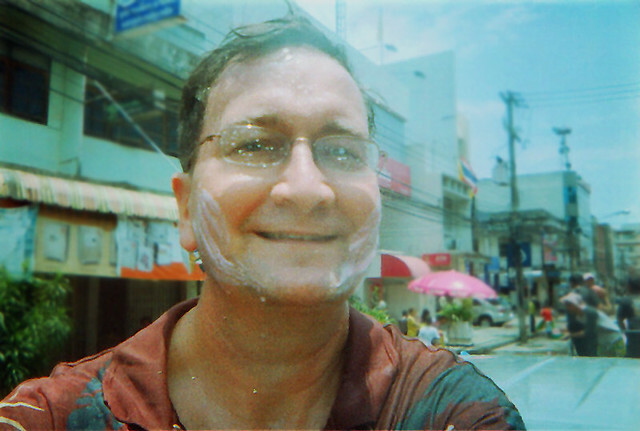 No fun to have a bucket of ice water in your face when you are riding a moped, but then again, if riding on Songkran day, you really should ride slowly and expect to get very very wet. The guy above with his colourful Songkran shirt is obviously enjoying the day! 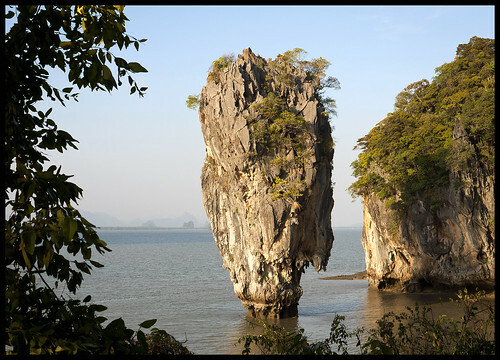 It was due to the number of accidents that the water throwing was limited to one day in Phuket a few years ago. A day for the kids ... for one day every year, the kids can get away with pretty much anything! They can soak strangers, definitely soak their family, they can play with water all day and nobody can get mad at them. 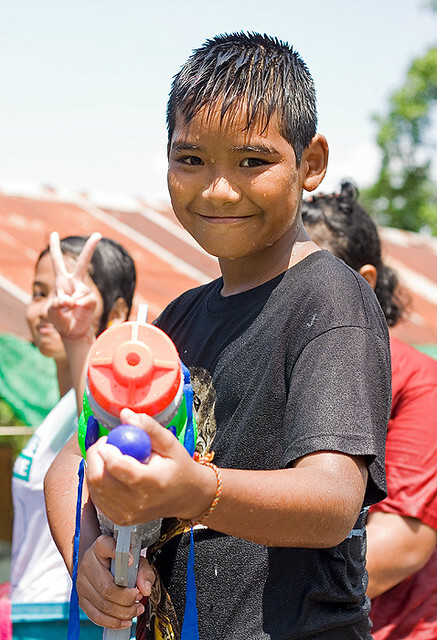 Our kids love it, I think all kids love Songkran! And you're never quite sure where the next soaking is going to come from. This year riding around in the truck I got drenched at regular intervals, many times by unseen assailants. There's absolutely no point trying to stay dry! The guys on the scooter (above) just got owned! 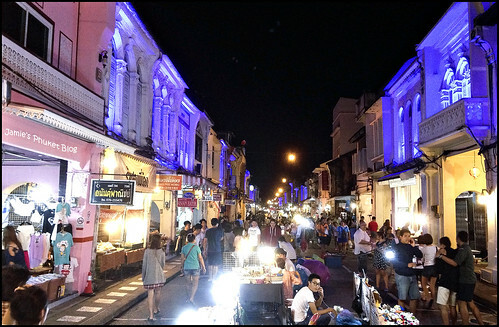 That photo was taken in Phuket Town on Phuket Road on the way south towards Sapan Hin park. 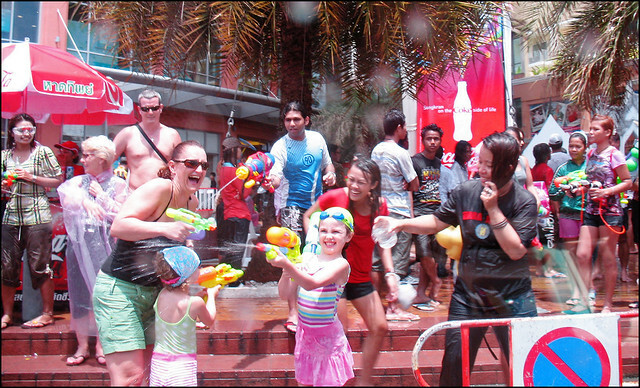 Songkran is what it is - you can have fun or you can grouch. For one day, getting soaked is fun, especially as April 13th is normally going to be a very hot day, like it was this year. 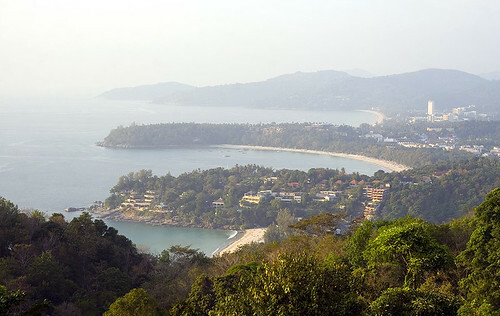 I am happy that it's only one day in Phuket - I know that in Chiang Mai it goes on for days, which could be a drag. 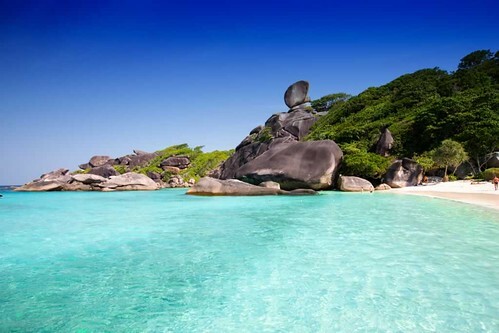 In Chumphon, there was only water throwing in town for 1 day, but on the 14th people headed to the 2 main beaches near Chumphon (Sairee and Thung Wua Laen) to continue the party. I was very happy in 2011 to be more involved with the family. A good Songkran. Happy New Year!